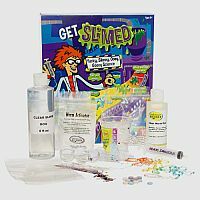 Get Slimed is one of the gooiest, amazing science kits ever. 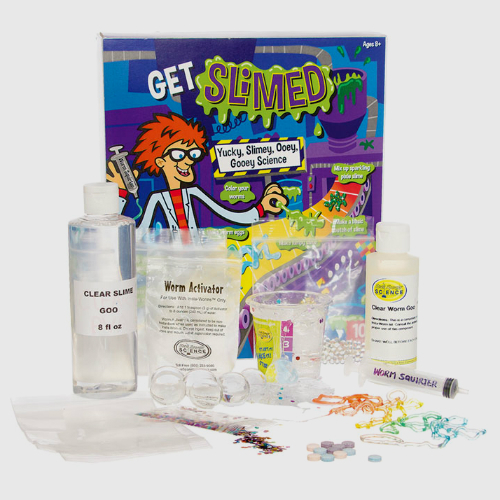 Get ready to mix up a perfect batch of Slime and then stir in your favorite additive from styro-beads to glitter to your heart’s content. Or create the most disgusting slime concoction to surprise your friends and family. Then, use the Worm Squirter to make up a batch of multi-colored, slimy Worms! It's yucky, slimey, ooey, gooey science! Measures approximately: 9.00 x 10.50 x 2.50 inches..